Pipeshark has been involved in trenchless technology for a long time. We were the team that got a lot of the original approvals for pipe bursting and trenchless sewer repair within the state of Pennsylvania. Early on we became so convinced of the future of this technology that we decided to abandon the other plumbing work we were doing and become specialists in all phases of trenchless or no-dig technologies. Over the years we’ve been on various advisory committees and currently serve on the International Pipe Bursting Association’s Lateral Committee. As we helped develop the industry, we realized that the initial goal of limiting the damage brought on by traditional excavation was just the beginning. Once the colossal mess of traditional trenching was eliminated, secondary causes of landscaping damages could be addressed as well. So we pioneered other changes in our operations which would protect landscapes and infrastructure even further. As we gained attention for such planning, nine years ago a trade publication did a cover story on us entitled “Landscape Artists” which highlighted the landscape friendly practices we had developed. We continue to be your landscape’s best friend by the way we lay out and pursue our work. 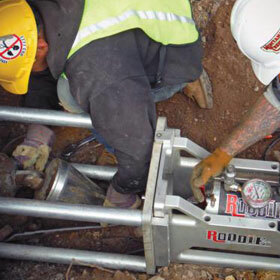 We expanded into other trenchless technologies and now offer pipe bursting, pipe lining, and pipe boring. Furthermore, we found we could often combine different techniques to get even better results. We’ve been called to help in to many situations with difficult working conditions or really tight timelines. We’ve been successful in solving many problems that required creative use of trenchless technologies, a concrete plan and the discipline to adhere to the plan. One recent challenge was featured in the April 2014 edition of Cleaner magazine. This publication focuses on sewer and drain industry specialists. A Pipeshark project was the topic of Cleaner magazine’s monthly “Tough Job” column. The article highlighted a series of pipe bursting installations we did in October 2013 in Glacier National Park in Montana. This project consisted of replacing 2,000′ of 6″ sewer mains in just a week! This job was no easy task, especially because at that time and altitude in Northern Montana the weather was turning wintry. The specs called for protecting all trees – alive or dead, standing or fallen, and no wildlife could be disturbed. It’s the only job we’ve done where we needed to complete a bear awareness training before we started. We planned well, worked hard, and got the results everyone wanted. We are proud of the work we did on that project, and if you’d like to read more about it, click here. We take pride in all the work we do. Whether it makes a trade journal or not, we approach every job the same. We plan it, work hard, and take satisfaction in producing good results in the end. PipeShark is often featured in industry magazines for our expertise in pipe and sewer repair, pipe bursting, pipe lining and boring and more. Check back here for all the latest media coverage and news about us. Pipeshark is featured in this month’s (April) issue of Cleaner magazine. We’re excited to be featured in the April 2014 issue of Cleaner magazine – a publication dedicated to sewer and drain specialists, focusing a lot on the trenchless technologies such as pipe lining and pipe bursting. Under their monthly “TOUGH JOB” column they chose to write about a series of pipe bursting installations we did in October 2013 in Glacier National Park in Montana. The story, which is titled “Crown of the Continent” recounts the challenges we faced to replace 2,000′ of 6″ sewer mains in just a week. The Glacier National Park had very tough specs to follow. These included protecting trees from damage – and that’s ALL the trees — alive or dead, standing or fallen. It is the only job we’ve ever done where we needed to complete a bear awareness training before beginning. (No bears did come into our work area, but we could see them on the mountainside above.) The new piping was the typical HDPE piping you would expect but it was the heavier DR11 instead of DR17. We had expected the HDPE piping to be fused when we arrived, but it was too difficult to find a HDPE pipe fuser with the experience necessary. So we needed to do all the fusing as well as the pipe bursting. This installation also gave us a chance to work with RODDIE manufacturing’s pipe bursting equipment, which we had seen work before but had never operated ourselves. The old sewer line was supposed to be clay piping (terra cotta piping) but turned out to be mostly extra heavy cast iron piping with some ductile piping as well.The RODDIE pipe bursting equipment handled it all very well. The owner, Rod Herrick and his whole staff were very supportive and just all around great people. Like a lot people in this industry they were very willing to share the lessons learned the hard way in their own pipe bursting experiences – really nice people to hang out with. Rod even let us take a peak at his latest invention, the Basement Buddy. It’s a portable directional drill he originally designed to install new water services from a basement to the curb stop. However, he has also used it in conjunction with his pipe bursting equipment to install new sewer lines where none existed before. Once we saw it operate, we told him to send the first one available East to us.So it was really an eventful week for us. Glacier National Park was a beautiful place to work. Surrounded by majestic mountain views during the day and a sky loaded with stars peaking through the evergreens at night. No matter the weather or the hours worked, it was impossible to forget that you were working in one of the most beautiful places in North America. When we broke for the night, we drove along a lake backed by snow capped peaks to exit onto the Blackfeet Indian Reservation, which is where we slept in a trailer while working. The reservation is huge — larger than either the states of Rhode Island or Delaware with a population density of less than four people per square mile. For a bunch of guys from the East Coast, that was a bonus experience. It was an exciting, exhausting, and rewarding week. It’s a shame these types of jobs can’t be set aside just for company retreats. It was a better team building experience than any other activity I can think of. I know a lot of people in the pipe bursting industry who would love to do it — fly in, work like hell, have some beers and swap stories, then fly home. Good times.